This Heavyweight i-slot review is full of gold. You've got your opponent, the good old referee, the big gold heavyweight belt, dumb-bells, the spit bucket, a speed bag, the ring girl, the trainer and, what fight would be complete without a first aid box? Various Knock Out icons are scattered around to give you the feel of being in the ring. 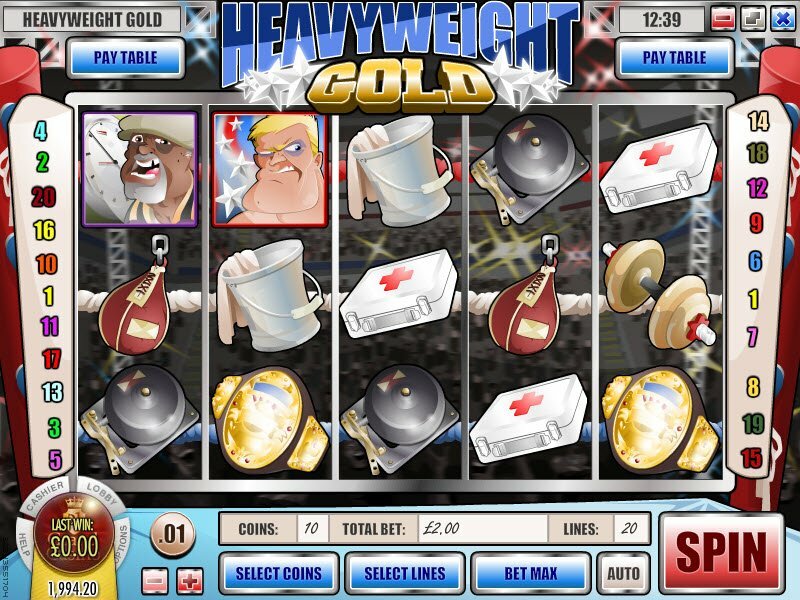 The Heavyweight Gold slot machine starts with a little introductory skit, getting you in the mood with a real boxing ring, while the crowds cheer. Once we arrive at the actual game, the reels resemble a good old fashioned boxing ring, with turnbuckles and a cheering crowd egging the fighters on to the end. Will it be a knock out? With 5 reels and 20 paylines, playing the maximum of £/$/€50 per spin could net you a huge amount, especially if you keep it above the belt and score a knock out. At odds with the excitement, the music hardly lets you smell the blood, sweat and tears a normal ringside view would offer. It is rather mellow and, of course, repetitive to say the very least! 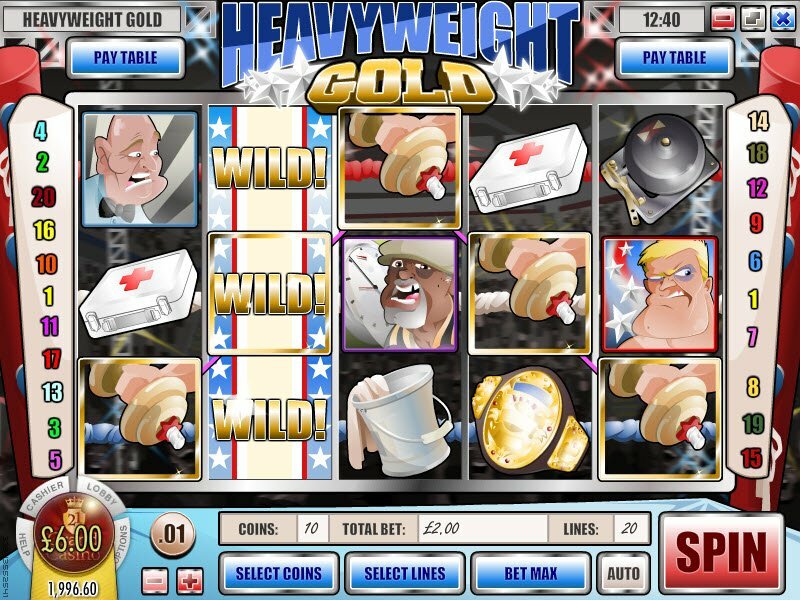 The Heavyweight gold slot wild symbol is our boxer and, if you find him on reels 1, 2 or 3 you have yourself a winning combination. The ever faithful ring girl is our scatter symbol and, three or more beautiful ring girl symbols and you have triggered free spins, with all wins multiplied by 3! The ring girl will appear to you to show you your card with how many free spins you have triggered when you being this winning feature. At the end, the ring girl will parade out with a card showing your total winnings during that free spin fabulousness. The Heavyweight Gold slot starts with a little introductory skit, getting you in the mood with a real boxing ring, while the crowds cheer. 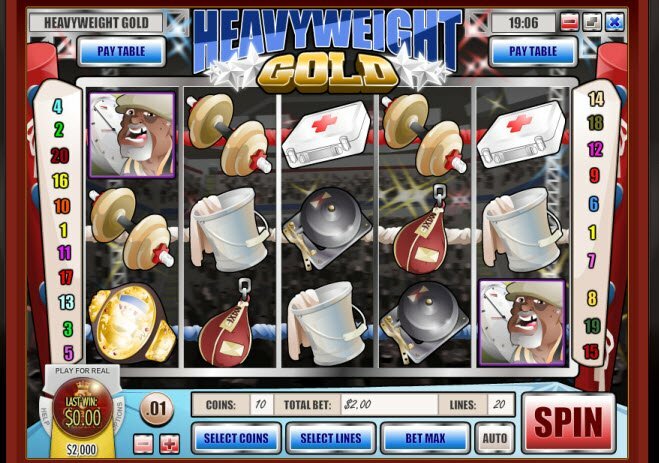 The Heavyweight Gold slot bonus round itself is a real knockout, spin three or more bonus symbols and you're really gonna put your guy in for it. He will have to face the hardest three rounds of his life. He's going to have to punch out his opponent, all the while defending himself from the ultimate embarrassing knockout. Each punch will be rated and, the better your punch, the better your prize.